Zhang Dejiang (l) chairman of China's National People's Congress, and Hong Kong Chief Executive Leung Chun-ying (r) look at a model of newly built public housing blocks due to open later this year in Hong Kong on May 19, 2016. China’s senior official in charge of Hong Kong affairs has ended his three-day visit to the former British colony with carefully timed assurances that Beijing will not seek to “mainlandize” the semi-autonomous territory or violate the one-country, two-systems formula that underpins the city’s unique freedoms not found elsewhere in the country. That formula is the basis on which Hong Kong enjoys a capitalist economy and a legal system that operates according to the common law, at least until 2047. But many Hong Kong people feel their cultural identity is under siege, fueling a strongly localist political movement. The visit by Zhang Dejiang, who is the chairman of the Standing Committee of the National People’s Congress and ranks third in China’s political hierarchy, is the first by a senior leader since the so-called Umbrella Movement that rocked Hong Kong two years ago. The timing of his presence is also viewed against the backdrop of upcoming elections to the Hong Kong legislature in September and the selection of the next chief executive in 2017. Opinion polls consistently show present leader, CY Leung and his government to be deeply unpopular. Rising localist sentiments — fueled by anger over large numbers of mainland shoppers swamping some neighborhoods in search of goods for resale across the border, and by the increasing use of Mandarin in this Cantonese-speaking society — have charged the social atmosphere and increased the chances of radical localist candidates winning seats in the legislature, as has already happened in a recent by-election. Some factions are urging that Hong Kong’s future be decided by a referendum, while others are calling for outright independence. Addressing an invitation-only banquet — boycotted by all pro-democracy legislators and held in a conference center surrounded by thousands of police, including anti-terrorist forces — Zhang said being passionate about one’s hometown was natural, and that Hong Kong’s uniqueness and values were respected under the “one country, two system” concept embedded in the territory’s Basic Law. Hong Kong Chief Executive Leung Chun-ying (l) looks at Zhang Dejiang (r) chairman of China's National People's Congress, during a banquet in Hong Kong on May 18, 2016. But, he warned, “a tiny minority of people [in Hong Kong] resist ‘one country’ and the Central government. They even brandish the banners of ‘Hong Kong independence’". “It’s not a matter of localism, but attempts to secede Hong Kong from the country in the name of localist sentiment,” he said. Seeking to allay the fears of many that they are being over run by mainlanders and losing their identity, Zhang referred to the original thinking behind the formula for Hong Kong’s return to Chinese rule, and sought to assure Hong Kongers that their sense of cultural identity was secure. “There are so-called suggestions that the Central government was seeking [the] mainlandization of Hong Kong , or even changing ‘one country, two systems’ to ‘one country, one system.’ They are completely baseless,” he said. 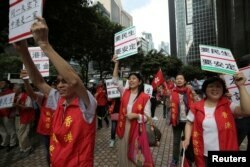 Supporters of visiting Zhang Dejiang, the chairman of China's National People's Congress, hold placards which read "Need livelihood, need stability", in Hong Kong on May 18, 2016. Just before his banquet appearance, Zhang also met with four representatives of the legislature’s so-called pan-democrats during a cocktail reception. It was the highest-level meeting between pro-democracy figures and a senior Chinese leader since China’s resumption of sovereignty in 1997. The four were Democratic Party chairperson Emily Lau, Civic Party leader Alan Leong, Cyd Ho of the Labor Party and unaffiliated lawmaker Joseph Lee. Lau said that although Zhang arrived 10 minutes late, he also stayed late, so their meeting was not shortened. Known for her blunt style, Lau said she told Zhang, in the presence of CY Leung, that Leung should be replaced and the process of political reform re-started. “I told him that many Hong Kong people are very unhappy because of the poor governance, because Beijing refused to allow us to have democratic elections, and CY Leung is not a suitable person to be chief executive, and we hope Beijing would revisit the NPCSC decision about election of the chief executive,” she told VOA. There were, she said, deep problems of governance that were getting worse under the current chief executive. Alan Leong, the Civic Party leader, arrived at the meeting with Zhang wearing a yellow tie and matching handkerchief — the color of the 2014 Umbrella Movement protests that shut down sections of the city of several months. FILE - A protester carries a placard as hundreds of airlines related staff and citizens protest against Hong Kong Chief Executive Leung Chun-ying, who allegedly put pressure on airport staff to help his daughter retrieve a bag left outside of restricted areas, during a demonstration at the arrival hall of the Hong Kong Airport in Hong Kong, China, April 17, 2016. At the very same time as the meeting between the pan-democrats and Zhang, police outside the heavily fortified banquet venue were removing from the news media any yellow items, including a small hand towel used by a photographer to wipe his camera lens. Leong used his few minutes with the visiting leader to criticize CY Leung as well, telling Zhang that the current chief executive was “not up to the required or desired standards and had better not to seek re-election for another five-year term,” he said. He also described the atmosphere as “civilized,” and that Zhang gave largely stock, unsurprising answers and nothing was unexpected. But he said Zhang seemed to be of the view that this kind of dialogue — recognizing the status of pan-democratic legislators for the first time — ought to be continued. CY Leung has not publicly commented on the meeting between Zhang and the pan-democrat legislators.